This blog is supposed to be a written shot of espresso to inform, excite and encourage you to experience Italy in 30 seconds or less but sometimes I get carried away and occasionally 30 seconds becomes a little more. But I hope you’ll bear with me. After all, in Italy time is relative and more relaxed than it is in the States and it seems it has always been so. 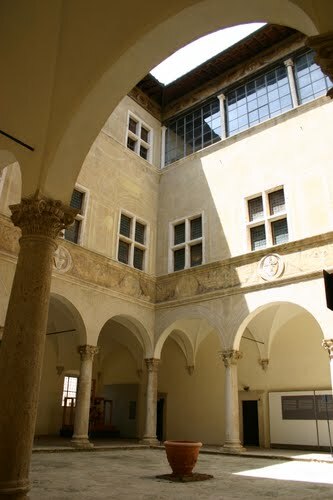 For example when I was in Pienza visiting Palazzo Piccolomini, the summer residence of Pope Pius II (1405-1464), time lingered as I walked through the elegant open courtyard into the gardens that overlook Tuscany’s stunning Val d’Orcia. Halls of period furniture and memorabilia led me into a room with a huge medieval clock called the More or Less Clock. It seems it’s called that because it works in 15 minute increments instead of seconds! Now, I began to understand the Italian sense of time and why my Italian cousins were always 15 minutes late. It’s my excuse to justify this blog entry being a little longer than 30 seconds . . . more or less.